We’d love your help. Let us know what’s wrong with this preview of Escaping the Nazis on the Kindertransport by Emma Carlson Berne. Tells the stories--in their own words--of several of the thousands of Jewish children rescued from Nazi Germany between 1938 and 1940 and brought to new homes in the United Kingdom. Memoir pieces, poems, photographs, and other primary sources bring their stories to life. To ask other readers questions about Escaping the Nazis on the Kindertransport, please sign up. Escaping the Nazis on the Kindertransport is the true story of some 10,000 children and their departure from their parents into an unknown future. 7 different children's stories are brought to life along with their fate. There are pictures, poems, and letters along with descriptions of the frightening journey away from their parents. The end of the book explains whether or not their parents survived and how the children's lives unfolded. It contains a glossary, discussion questions, and a timeline at the end. The book is written for middle grade ages. I highly recommend this book for schools, parents, and anyone who has an interest in learning about the Holocaust. When reading books about WWII and the Holocaust, I always find myself getting emotional, and very angry. When I was in school, in my opinion, we didn't learn enough about it. It wasn't until I went to college that I wanted to learn more, and started to understand how important it was to remember and educate others. Kids need to read these books! We must never forget this. Jewish people were afraid. ... But where could they go? All over the world, countries had closed their doors to refugees. ... No country wanted to be stuck with thousands of poor, frightened people who were fleeing persecution. This book is a children's book that explains the kindertransport. This was a desperate attempt to save Jewish children. Great Britain's government was pressured by the British Committee for the Jews of Germany, and the Movement for the Care of Children from Germany, the Quakers, and other small groups to take in Jewish children as refugees. Great Britain would only allow in children under the age of 17. No parents would be permitted. ... The government was wary of adults entering Great Britain with their children, then staying and trying to become residents. The parents might try and take jobs from British citizens... The government itself would not contribute money toward the children's care. Trains and occasionally airplanes were used to move 10,000 Jewish children out of Germany, Austria, and Czechoslovakia and into England. Priority was given to orphans. This book explains Kristallnacht to children and helps them understand the situation in Europe in WWII. It describes how Jews could not live safely in Germany or other countries under Nazi rule. Not only does it use facts of what happened, but it also uses first-person narratives from survivors of kindertransport, focusing on seven individuals and their specific stories. What happened to them? Did they ever see their parents again? What was their life like under Nazi rule and how did it compare to living in England? Rudolf shouted to his son to smile. Kurt managed to, though most likely he wanted to cry. At the sight of the smile, the Nazi soldier who was supervising said to Kurt's parents, "So young and already a hero." These were strangely kind words from a Nazi to a Jew. - Teaches children about the Holocaust, Nazis, Kristallnacht, and WWII. - Uses a human touch by personally introducing seven individuals and walking you through their life stories, often using their own personal quotes. "Our school happened to be just opposite on the street where the synagogue was. I was dragged out with a stream of children. Everybody went to the playground to watch these flames. And suddenly, someone said, "Oh there's a Jew, let's throw her on the fire as well." I don't know how I got home that day. I still don't know how I got home. And when I got home, my mother was absolutely shocked. My father had been arrested. My father was quite an outspoken person and so when they came to Buch[en]wald and when they took away all the men's braces and shoelaces, he protested and said "You can't treat these old people like this." So they made an example of him and they beat him to death in front of everybody to instill terror and obedience. They offered us my father's ashes in return for money. And eventually the urn came and we buried it in the Jewish cemetery but of course whether it was his ashes, no one knows." Some of the children are never reunited with their families because their families are murdered by the Nazis. - The book does not shy away from using words that you might have to explain to your children. Also, it has a glossary in the back that defines words such as pogrom and charnel house. - The book tells about the elderly 'kinder' - where are they now? Who did they become? Are they still alive (upon publication)? You see pictures of the seven as babies, as teens, and then as elderly adults. - Discusses some of the more complex ideas of WWII, beyond the simple 'Nazis are evil.' You can discuss with your child(ren) why Britain did not allow parents to travel with the children. Why did the government insist on having a child sponsored, refusing to pay any money itself? Why did some children on the kindertransport end up in internment camps in Britain? How was Kristallnacht a turning point for Jews who lived in Germany and Austria? Why was Hitler and the Nazi party murdering Jews, gay people, people with disabilities, Jehovah's Witnesses, and gypsies? This book does cover that Jews were not the only ones targeted by the Nazis. The Nazis had taken over Austria. Hitler was in power, and now just being a Jew was a crime. Rudolf lost his job. His boss explained to him that he, Rudolf, had a 'birth defect.' The birth defect? Rudolf was a Jew. - People who can talk about the Holocaust firsthand are dying out. It is important to put their stories to paper (the cloud?) before it is too late. Tl;dr - I can't really think of any cons to this book. It is very important to teach your children about the Holocaust. Adults/parents might even learn something they didn't know from this book. I certainly did! The pictures are wonderful and the whole book is designed to look like an old document. No need to only consult this if there is a school project - children are fascinated with history and will be interested in this without any prompting. It's very engaging. Ages: 8-12. The older age range might be a stretch - the book is fairly simple. Escaping the Nazis on the Kindertransport by Emma Carlson Berne is a book made for middle grade kids but adults will find this book wonderful also. There are pictures of the children, their stories in their own words, poems, pictures of them as adults, follow ups on those in the story, and a timeline in the back of the book. The writing reads so descriptively..
"Inside the train car, children leaned against each other in the seats, sleeping, mouths open, curled like shrimp in the laps of older br Escaping the Nazis on the Kindertransport by Emma Carlson Berne is a book made for middle grade kids but adults will find this book wonderful also. There are pictures of the children, their stories in their own words, poems, pictures of them as adults, follow ups on those in the story, and a timeline in the back of the book. The writing reads so descriptively..
"Inside the train car, children leaned against each other in the seats, sleeping, mouths open, curled like shrimp in the laps of older brothers and sisters." The story is so touching and moving from the parents view, which you read through their letters, and from the children's. The book takes you through the history, the society, and events in a way that children can understand, how we all can understand, how this could happen and could happen again if we are not careful without hate. "He had been legally voted in by the German people. But gradually, he had become a dictator." "Adolf Hitler and the Nazis believed that some groups of people should not live in Germany: mainly, Jews but also gay people, people with disabilities, Jehovah's Witnesses, and people who disagreed with Hitler's policies, among others." This book was truly amazing in showing the strength and fortitude these children had to go alone, no parents allowed, to not know if they would ever see their family again, and move forward, be brave, and fight on. The courage and heroism of those helping the children was amazing also, thank those souls that fought hard for those 10,000 kids! Loved this book and I think children will learn love, caring, kindness, and courage from this wonderfully written book. Thank you NetGalley for this suggesting! This book, written for 8-12 year olds, contains stories of seven children who escaped Nazi Germany on Kindertransports funded by humanitarian groups in the years 1938 through 1940. Each of the stories has what I'm assuming are actual pictures of the children and their parents and it is heartbreaking to think of parents who had to make the incredibly difficult decision to send their beloved children alone on transports with perhaps a handful of family pictures or a beloved teddy bear - whatever w This book, written for 8-12 year olds, contains stories of seven children who escaped Nazi Germany on Kindertransports funded by humanitarian groups in the years 1938 through 1940. Each of the stories has what I'm assuming are actual pictures of the children and their parents and it is heartbreaking to think of parents who had to make the incredibly difficult decision to send their beloved children alone on transports with perhaps a handful of family pictures or a beloved teddy bear - whatever would fit into a small leather suitcase. Each child has a numbered tag around their neck and the corresponding number was written on their suitcase. The stories are simply told, but are not simplistic. We read of the emotions of children recalling the last time they saw their parent's faces or who suffered bullying and abuse at the hands of classmates who hated them solely because they were Jewish. Each story also has a bit of history about the time leading up to the Holocaust and together they depict the growing horror of what the Nazis were capable of. We also learn what happened to the children after the war and the memories they carried and what they did in their lives to honor their parents and remember the Holocaust. The book has an impressive bibliography and questions at the end suitable for classroom discussion. I was very moved by this book as an adult, and I think it would be a very powerful book for children and young adults. This is a very important, and strangely, topical book for today. As I was reading it, I kept thinking, "History is repeating, history is repeating, why does no one DO something about it?!?" Ever feel like Cassandra? This book, so is. It's geared towards a younger reader, not nearly as meaty as I would like it to be for me. For younger children, a good introduction to the horrors of the Holocaust. It's not overwhelming, but it is powerful and doesn't shy away from what the people interviewed in th This is a very important, and strangely, topical book for today. As I was reading it, I kept thinking, "History is repeating, history is repeating, why does no one DO something about it?!?" Ever feel like Cassandra? This book, so is. It's geared towards a younger reader, not nearly as meaty as I would like it to be for me. For younger children, a good introduction to the horrors of the Holocaust. It's not overwhelming, but it is powerful and doesn't shy away from what the people interviewed in this book went through. A very respectable bibliography and notes section. The pictures of the children in happier times before they had to leave on the Kindertransport are heartbreaking in their innocence and everyday normal-ness. Good book. Great for middle grade I would say. I wanted a bit more to it, so 4 solid stars. I do recommend this book to all ages though. History needs to be LEARNED from. From the sad state of affairs the world is in right now, I would say we still haven't learned this lesson yet. I am sorry to say we probably never will. The thing about World War II, and the Holocaust is that the survivors of both are dying off. We are probably the last generation that will hear first hand what happened directly from the sources, the people who survived. And each survivor who dies, who leaves this world, leaves behind stories untold. And we as adults have heard these stories, but what of the generation coming after us, children born at the turn of the 20th century, and later, who are being taught about these things, that to them, The thing about World War II, and the Holocaust is that the survivors of both are dying off. We are probably the last generation that will hear first hand what happened directly from the sources, the people who survived. And each survivor who dies, who leaves this world, leaves behind stories untold. And we as adults have heard these stories, but what of the generation coming after us, children born at the turn of the 20th century, and later, who are being taught about these things, that to them, are ancient history. Now, granted, it is history to me as well. My mother was alive in WWII, as a teenager, but in the United State, where the worst thing that happened to her was that butter was rationed. But for children studying World War II now, those who have to learn the stories we were taught, to k now that it should never happen again, what better way to teach them, than through the voices of former children, and that is why this book is important. It is not that it is one more story of WWII, but that it is the story not often heard, of the 10,000 children who were able to escape to the UK, on the eve of war, in the Kinderstransport. The book, told in the survivors words, as they remember it happening, as well as simple language, beyond the quotes, is easy to read, to sympathize with, and understand. For example, here is the quote from Ursula, as she is leaving to get ont he KInderstransprot. "The parting was terrible. That's the one thing I've never forgotten in all my life. And [my mother] had been so controlled. She'd always been a sort of solid support for us, and suddenly she showed her feelings and it was terrifying, really terrifying. You saw this face that showed all the just and agony she'd been through...I would have liked to have had a happier image of my mother. That's the only image, this contorted face, full of agony. It's very sad." There are 8 stories, one for each chapter, plus a 9th chapter to tell what happened to the children at the end of the war, and what happened to them in later life. There is also a time line, a Glossary, information about the kindertransport association, discussion questions and source notes. This would be an excellent book to have in the classroom or library, to put a more human face on the war, and the children who suffered. There are photos of Kristallnacht (Night of Broken Glass), as well as the children whose stories are included. GNab I received a free electronic copy of this work from Netgalley, Emma Carlson Berne, and Capstone, Capstone Press in exchange for an honest review. Thank you, for sharing your work with me. This is an excellent book for tweenies and teens - possibly even younger children. It explains the kindertransport and the reasons behind it and the night of breaking glass without graphic details. The photos of the children and their parents that were packed in their suitcases before they were placed on th GNab I received a free electronic copy of this work from Netgalley, Emma Carlson Berne, and Capstone, Capstone Press in exchange for an honest review. Thank you, for sharing your work with me. This is an excellent book for tweenies and teens - possibly even younger children. It explains the kindertransport and the reasons behind it and the night of breaking glass without graphic details. The photos of the children and their parents that were packed in their suitcases before they were placed on the train are exquisite. The fact that they never got to see their parents again is heartbreaking. The Kindertransport was a short-lived program that rescued approximately 10,000 Jewish children in Nazi occupied Germany, Austria and Poland and Czechoslovakia between December 1938 (just three weeks after Kristallnacht, and May 1940. The children were sent to live with families in Great Britain. I have reviewed a number of books about the Kindertransport before, but most of them were novels. In her new book, Emma Carlson Berne introduces readers to the program through the true stories of seven f The Kindertransport was a short-lived program that rescued approximately 10,000 Jewish children in Nazi occupied Germany, Austria and Poland and Czechoslovakia between December 1938 (just three weeks after Kristallnacht, and May 1940. The children were sent to live with families in Great Britain. I have reviewed a number of books about the Kindertransport before, but most of them were novels. In her new book, Emma Carlson Berne introduces readers to the program through the true stories of seven former Kindertransport survivors, including a detailed explanation of what was happening in Europe, especially after Kristallnacht, and how the Kindertransport program worked. The program was the brain child of British Jews and Quakers and only worked because at that time, Hitler wanted to get all Jews out of Europe. Still, It's hard to imagine parents willingly surrendering their children to strangers in the hope that they would be safe, but it just shows how dangerous Europe had become under the Nazis. It was up to the families to get their children to the transport train that would take them to the ships traveling to England, an expense difficult for Jewish parents to afford by 1938, having lost their jobs and most of their money having been confiscated by the Nazis. To make it more difficult, no parents or other family were allowed to travel with their children. For many, Berne points out, the train station would be that last time parents and children would ever see each other. Berne than recounts the experiences of the seven children and how they became Kindertransport children. Her writing style is very interesting. She invites the reader into the book with sentences like: "We can imagine the train whistle blowing. 'All aboard,' the conductor might have yelled in German over the crowd of frightened children and weeping parents." (pg 62) Each persons recollections are told in their own words, as well, taken from interviews done when they were adults, and adding a sense of authenticity that these are true stories and not the stuff of imagination. In addition to each person's story, Berne has included archival photographs of what Jewish life looked like in Europe before and under the Nazis and a collection of family photos each child must have taken to England with them. The whole book is set up like an old family album, including chipped, aged-looking pages. 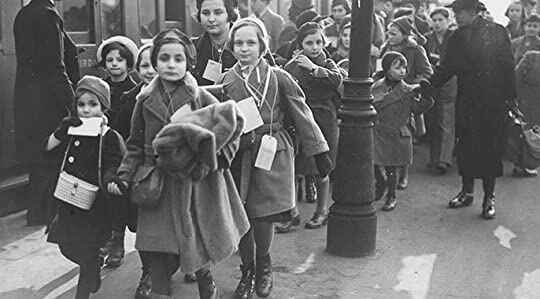 There is extensive back matter, including a timeline, a Glossary, information about The Kindertransport Association, which you might want to check for additional information, suggestions for further reading, discussion questions, and and extensive Bibliography. Escaping the Nazis on the Kindertransport is a well done, very well researched book. The seven stories included in it are poignant, and really bring home the feelings of desperation parents were feeling, but also the fear of the child suddenly being separated from their family, and not always being old enough to understand what was happening. This is a valuable teaching resource for classes studying the WWII and Holocaust. Pair it with some of the excellent novels that have been written about the Kindertransport for a really in-depth, well- rounded sense of how the events of the time impacted children. It is difficult to decide at what age and how children should have certain horrific subjects explained to them. Learning about horrible things that have happened centuries ago (and thus dulled by the passage of time and lack of first person accounts) is easier than learning about the recent past and present day cruelties committed by humans. It is difficult, but that education needs to be done. It is important that we understand from an early age what has happened before, and how people were aff It is difficult to decide at what age and how children should have certain horrific subjects explained to them. Learning about horrible things that have happened centuries ago (and thus dulled by the passage of time and lack of first person accounts) is easier than learning about the recent past and present day cruelties committed by humans. It is difficult, but that education needs to be done. It is important that we understand from an early age what has happened before, and how people were affected. This book is an excellent introduction to the events in the late 1930s Europe, specifically the Kindertransport and the beginning of the Holocaust. It does not describe the horror of the Holocaust graphically, yet it pulls few punches. Told from the points of view of Irene, Kurt, Ursula, Tom, Harry and Jack, all children who were evacuated to England on the Kindertransport in 1939. Each section describes life with their families before their escape, the trip itself, and a summary of their life afterwards. Read their honest, straightforward words describing the events. Everyone should. While the accounts of the children involved are meant to cover their entire life, this book leaves questions unanswered, in a way that will likely encourage readers to seek out more information on their own. Also, a timeline, excellent glossary, suggested further readings, and thorough bibliography are included. And notes on the Kindertransport association, which still operates today, that "unites these child Holocaust refugees and their descendants" and "shares their stories, honors those who made the Kindertransport possible, and supports charitable work that aids children in need." I got an ARC of this book through NetGalley. Thank you Capstone! I didn't know what to expect when I went into this book. It's such a serious subject to be brought up for children aged 8-12. In school we didn't cover World War II until I was about 12 or 13 years old. But I have to say this book does a great job in telling this story. You got to see the reasons behind why the children had to flee, and in a very private manner. The usage of photographs, poems and the survivors' own writing made it I got an ARC of this book through NetGalley. Thank you Capstone! You got to see the reasons behind why the children had to flee, and in a very private manner. The usage of photographs, poems and the survivors' own writing made it feel real. This has happened. It isn't just a story. On the last pages you get to know what happened to the children you've read about after they arrived in England. This left a feeling of hope even though the author made it clear how few they were. 10 000 children on the Kindretransport. 6 million Jews killed only in concentration camps. Interesting, with a nice mix of personal stories and facts. A great book for kids as an introduction to some of the more personal stories to come out of the Holocaust. 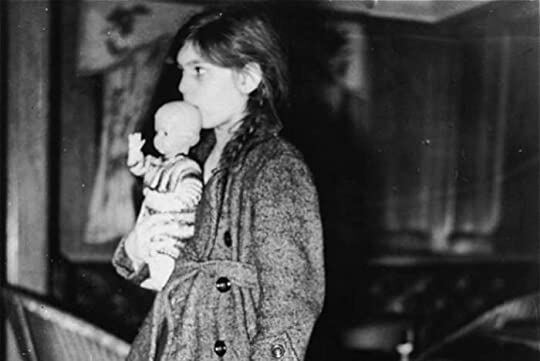 In 1938, after the devastation of Kristallnacht and before the outbreak of the Second World War, the United Kingdom government organised a rescue effort who saved nearly 10,000 children from the Nazis. The first Kindertransport left on December 2, 1938 and the last one left from Netherlands on May 14, 1940, as Dutch forces fell to the Nazi German forces. This is a touching book, that collects memoir pieces, poems, photographs and other sources to tell the stories of seven of these children who e In 1938, after the devastation of Kristallnacht and before the outbreak of the Second World War, the United Kingdom government organised a rescue effort who saved nearly 10,000 children from the Nazis. The first Kindertransport left on December 2, 1938 and the last one left from Netherlands on May 14, 1940, as Dutch forces fell to the Nazi German forces. This is a touching book, that collects memoir pieces, poems, photographs and other sources to tell the stories of seven of these children who escaped the Nazis on the Kindertransport. It is an heart-breaking journey — these children, travelling toward an unknown country, who did not know if they would have seen their parents again and what the future held for them and if they would have returned to their own homes. In the last chapter we are told what happened to these children after their arrival in the United Kingdom and after the war — I cried so much. The book combines memories and history notions in a smart way. It is supposed to be a children’s non-fiction book, but it is well worth reading, no matter how old you are. I am sure that the experiences of these young refugees will help many of us to understand how it felt to lose one’s home and family in World War II, and how it might feel for today’s refugees. Thanks to Netgally and Capstone for making this book available for an honest review. Thanks to Capstone Press, NetGalley, and the amazing Emma Carlson Bernes for the digital ARC in exchange for an honest review. Between 1938 and 1940, right before the beginning of WWII and right after the famous Kristallnacht, The first Kindertransport left Germany to the United Kingdom. In this book, Emma Barnes writes about the war from the perspective of the journey of a small group of Jewish children rescued from Nazi G Thanks to Capstone Press, NetGalley, and the amazing Emma Carlson Bernes for the digital ARC in exchange for an honest review. In this book, Emma Barnes writes about the war from the perspective of the journey of a small group of Jewish children rescued from Nazi Germany to seek asylum in Britain. As the war was heating up in Germany, other European countries made an agreement to allow only the children of Jewish parents temporary asylum in their country. These are the stories of some of the few remaining survivors who were on the transport during the late 1930's. Told through gripping first-hand accounts, photographs, memoirs, and poetry, the readers get a glimpse into this more-or-less unknown side of WWII. These children survived, but the journey to asylum and what happened once they got there, is an inspiring tale. They faced hardships of being refugees and watching from afar the death of loved ones thrown into concentration camps. These children did not have a home and never got to say goodbye, but they went on to be award-winning authors and famous professors who gave back to the world that gave them the chance to live. Great introductory book for youth on the Holocaust, WWII and specifically the children that escaped. This book featured 8 stories of children and social workers that participated in the events and share their photos, poems and memories of the events. The events are simply written with lots of big picture ideas and background information for kids to understand what is happening and why. Thought some details were a bit incomplete, like what happened to some of the kids families, though we do find Great introductory book for youth on the Holocaust, WWII and specifically the children that escaped. This book featured 8 stories of children and social workers that participated in the events and share their photos, poems and memories of the events. The events are simply written with lots of big picture ideas and background information for kids to understand what is happening and why. Thought some details were a bit incomplete, like what happened to some of the kids families, though we do find out about some of them in chapter 9. I thought the wording was a bit presumptuous however with phrases like "Tom might have...he had almost certainly never...Tom must have...Tom perhaps...". I would have much rather them stuck to what they knew or stated what they thought to be true as facts overall. Clearly not all the kids were scared because the picture of kids were smiling in transport. Maybe say some would have been scared and some excited? It sounded presumptuous. Recommends it for: little history nerds. Escaping the Nazis on the Kindertransport is a good book. It is historical non-fiction about the Kindertransport, a train that saved a lot of people during the years leading up to World War 2. It is short but well written and has many pictures. The book tells the stories of many people who survived on the Kindertransport and then tells about what happened to them after the war. One of them wrote a poem about the Kindertransport. There are also some quotes from the survivors. I would suggest this Escaping the Nazis on the Kindertransport is a good book. It is historical non-fiction about the Kindertransport, a train that saved a lot of people during the years leading up to World War 2. It is short but well written and has many pictures. The book tells the stories of many people who survived on the Kindertransport and then tells about what happened to them after the war. One of them wrote a poem about the Kindertransport. There are also some quotes from the survivors. I would suggest this book for ages 8 to 13 as it is dark but short. 4 stars out of 5. 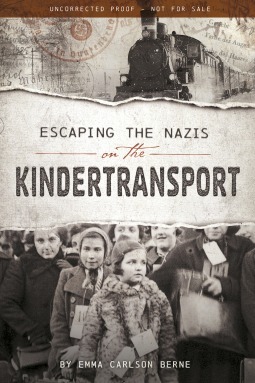 This was a good glimpse into the proceedings that became known as Kindertransport. 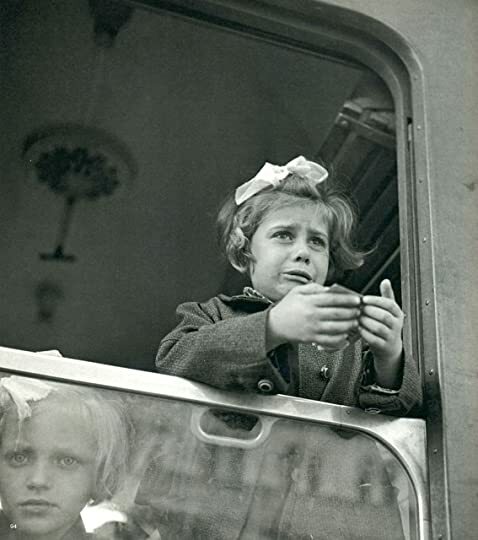 Children were evacuated from Germany and the surrounding countries just before WWII broke out. This book focuses mainly on the children. Poems, pictures and stories are taken from the records of the now-grown children as they look back on that time of their lives with mixed emotions. Excellent first person accounts of six children who rode the Kindertransport between 1938-1939. Opening the book with poems from one man who rode the trains is compelling, and it is wise to follow up with each rider's life post-WWII. The book would benefit from more photos of the children as adults, and maps of the train routes to "place" the action in the world. A nice introduction for upper elementary or reluctant middle school readers. Heartbreaking but a story that deserves retelling over and over. We read stories from individuals who, as children during Hitler’s regime, were put aboard the Kinder transport to England to save their lives. After reading Escaping the Nazis on the Kindertransport I reflected on how things still haven’t changed because the politicians are still causing harm to children who are not white all over the world. I had no idea that the Kindertransport involved travel by not just train, but by plane, and boat. I also had no idea that ten thousand children were saved because of the Kindertransport. I enjoyed reading each child's story and learning what happened to them afterward. This book is geared toward children but is inspiring reading for all ages. While short, this book contains a powerful message. The photographs and personal story touch makes it more real. I also liked the timeline added to the back of the book, as well as the vocabulary at the back. This is an excellent book to use to teach WWII, and more importantly the impact of the Nazis on the Jewish community to younger students. This is an amazing book! I really dont have that much to say about it. I just really like it! I love history so this book is amazing! Oh...Also I never heard of the Kindertransport before I got this book! so thank you for telling me about this! Good choice for younger readers , 8-12. It's a good introduction to an important time in history. Perfect for small group reading 5th grade. A nice short nonfiction children's book. I didn't know about the Kindertransport before reading this book. Several different children's stories are followed. Emma Carlson Berne is the author of the YA thrillers STILL WATERS and NEVER LET YOU GO (coming Fall 2012 from Simon & Schuster). She has also written the thrillers FIGMENT and CHOKER under the pen name Elizabeth Woods. She lives and writes in Cincinnati. Learn more about Emma and contact her directly at her website, www.emmacarlsonberne.com. Or check out Emma Carlson Berne Books on http://www. Emma Carlson Berne is the author of the YA thrillers STILL WATERS and NEVER LET YOU GO (coming Fall 2012 from Simon & Schuster). She has also written the thrillers FIGMENT and CHOKER under the pen name Elizabeth Woods. She lives and writes in Cincinnati. Learn more about Emma and contact her directly at her website, www.emmacarlsonberne.com. Or check out Emma Carlson Berne Books on http://www.facebook.com/EmmaCarlsonBe... or follow her on Twitter.